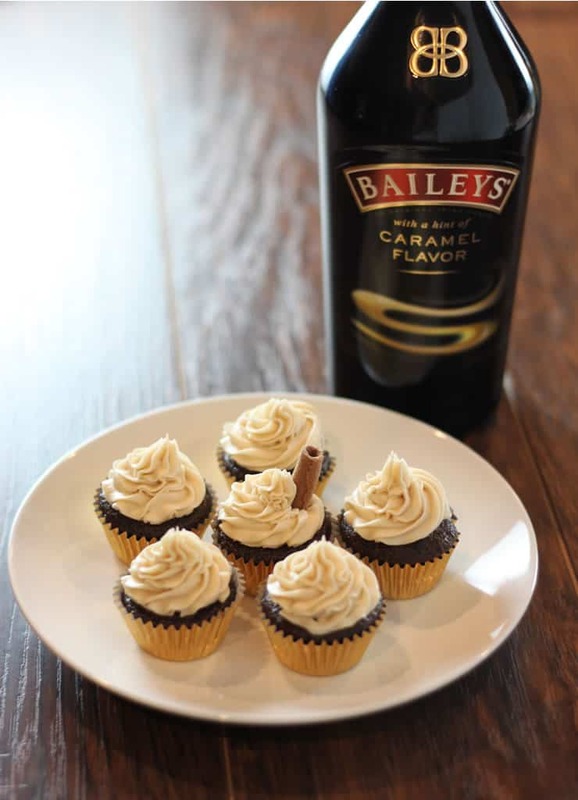 Baileys is great with everything and by itself on the rocks, which is why I combined my favorite flavor, Caramel Baileys, with my favorite chocolate cupcake recipe to make Caramel Baileys Cupcakes & Kahlua cream filling. 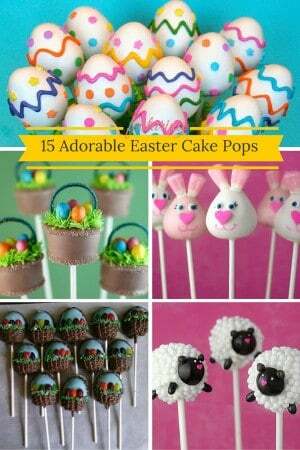 Admittedly, there are a lot of ingredients in these tasty little treats. 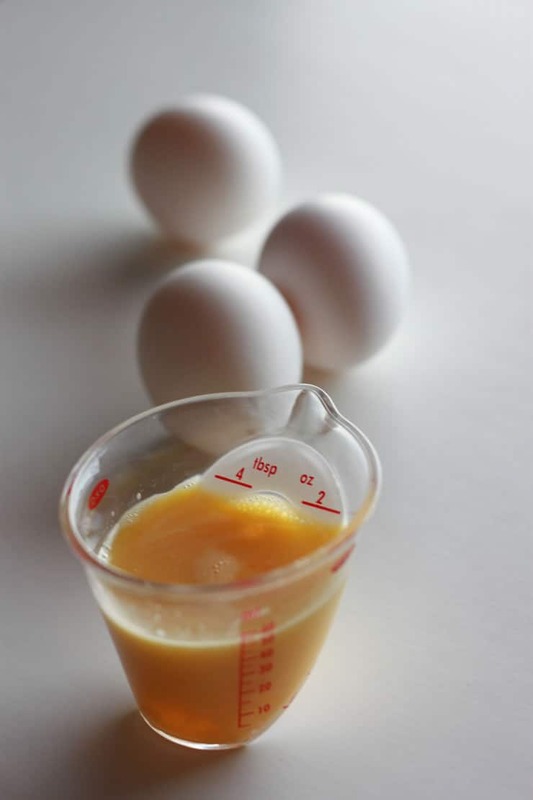 The only tricky part of the recipe, if you’re going to make 12 cupcakes as the recipe calls for, is you’ll need to use 1.5 eggs, so the best way to handle this is to whisk two eggs together and measure out about 4 Tbsp of egg mixture. I use a handy little Oxo ounce and Tablespoon cup for eggs or liquid ingredients, since traditional measuring spoons are difficult to use with liquids. After the cupcakes are baked and cooled, I used a long narrow tip on my piping bag to fill each cupcake with the yummy Kahlua cream. 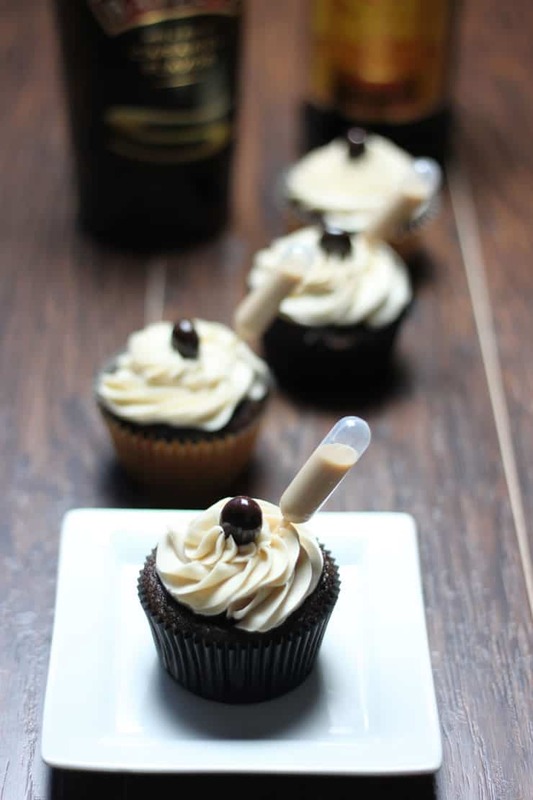 Once I top the cupcake with the Baileys Frosting, I finish it off with a chocolate covered espresso bean and a pipette of Caramel Baileys (in case you want a little more Baileys). 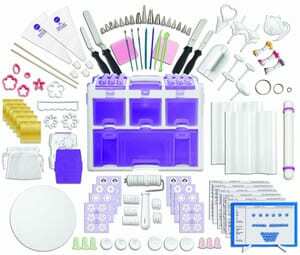 🙂 I couldn’t find the right sized pipettes on Amazon, so I ended up at Restaurantware which has the perfect size, but you’ll need to buy more than you’ll ever need. I even decided to make a few mini Baileys cupcakes without the cream filling. Instead of the pipette and chocolate covered espresso bean, you could add a Pirouette wafer roll or those adorable chocolate rolls. 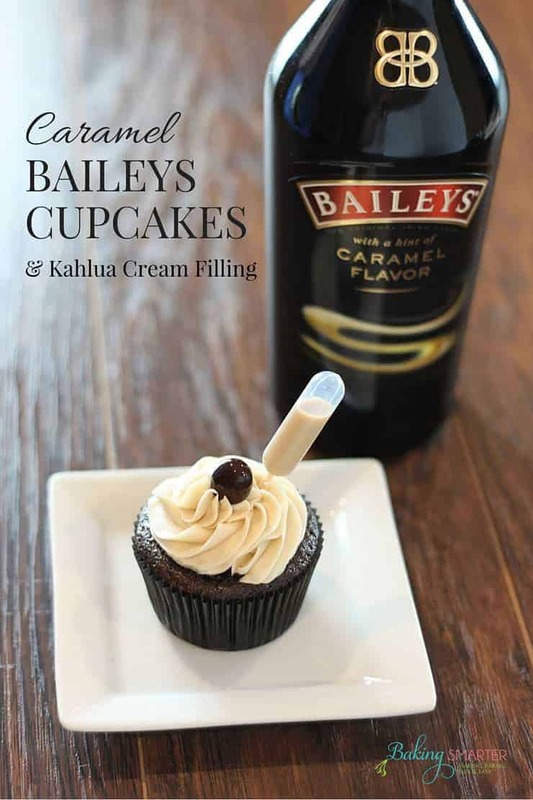 Use your favorite Baileys flavor to make perfect chocolate Baileys cupcakes with a Kahlua cream filling and Baileys buttercream frosting. Preheat the oven to 350 degrees F. Line muffin pans with liners and set aside. In a large bowl, whisk flour, sugar, cocoa powder, baking soda, baking powder, and salt. Add oil, coffee, Baileys, and eggs. Beat at medium speed with an electric mixer until smooth. Mix in the sour cream and vanilla. Spoon the batter evenly into prepared muffin cups, filling each ⅔ full. Bake until a tester inserted in center comes out clean, for 16 to 18 minutes. Let them cool in pans on wire racks for 5 minutes. Remove from the pans and cool completely on wire racks. 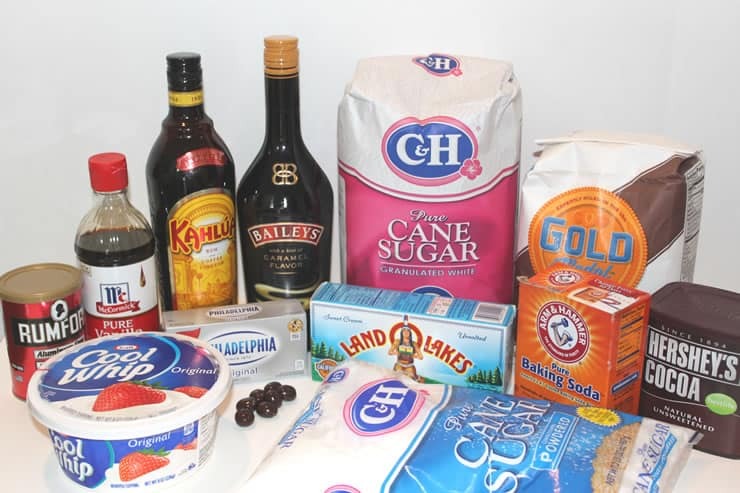 Kahlua Cream Filling - In a small bowl, whip the cream cheese at medium speed with an electric mixer until smooth. Slowly add the Kahlua and fold in the whipped topping. Cover and chill. Spoon Kahlua Cream Filling into a pastry bag with a long narrow tip. 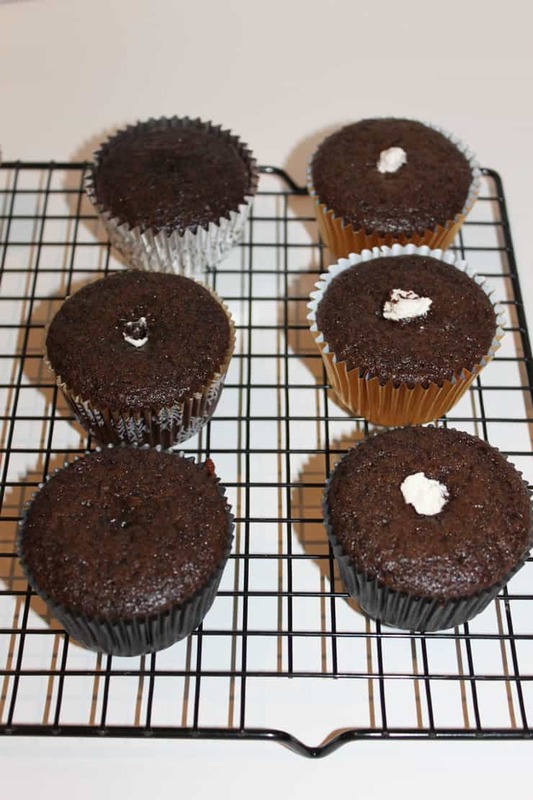 Insert the tip into the top of cupcake and squeeze about 1 tablespoon of filling into center of each cupcake. Baileys Buttercream Frosting - In a medium bowl, beat the butter at medium speed with an electric mixer until creamy. Gradually add the confectioners' sugar, beating until smooth, then add in the Baileys. 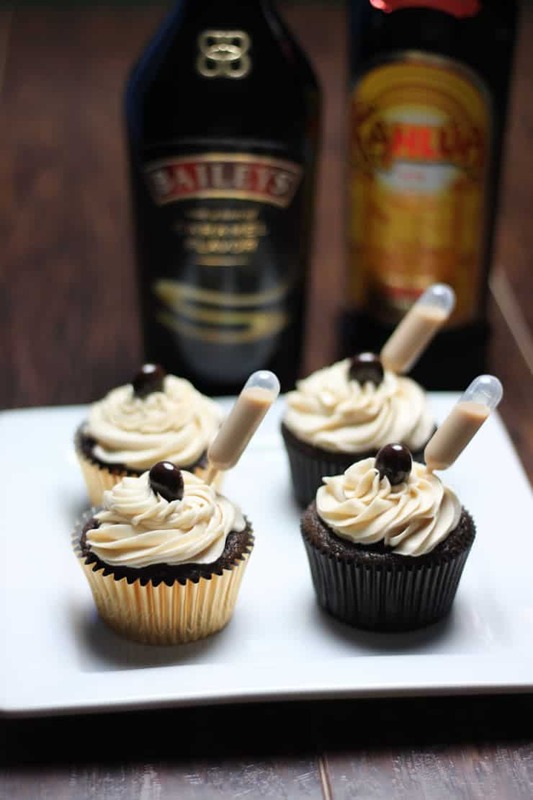 Pipe the Baileys Buttercream frosting on top of the cupcakes and garnish with chocolate covered espresso beans. 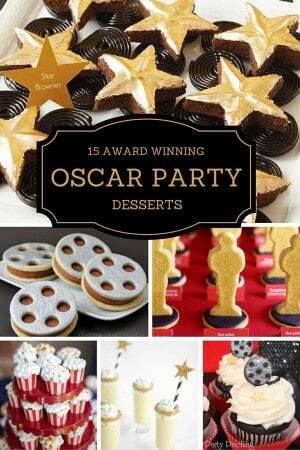 « Super Bowl Desserts Everyone Will Love!